What I think is so interesting about "Tora! Tora! Tora!" is that it's not one sided, it cuts back and forth between the US and Japan. Scenes are never really dull and are pretty necessary, as they all come together to tell a very unique (and true) story. What I also think is really interesting how the film had two production teams: an American one for the United States parts and a Japanese one for the Japanese parts. What really surprised me that Kurosawa was going to do the film, and even shot some footage, but he left the project. Each do a superb job creating the events and tensions people felt, and I really liked how the Japanese parts are very authentic. They don't speak English, but rather, Japanese and there are subtitles. While not so many movies do that as of late and just have people speak English instead of a native language, I still think it's a nice experience. If you've never seen it, "Tora! Tora! Tora!" is a very rewarding war movie, and maybe with this new special edition DVD release, it'll gain a bigger audience and hopefully be held in higher regard. Still, I personally think this re-release is to cash in on summer 2001's "Pearl Harbor" (as the DVD is being released ten days before that film opens). "Pearl Harbor", of course, looks like it's going to be another Bruckheimer hit and one of the biggest movies of all time... but now I'm getting off topic. Just sit back and watch "Tora! Tora! Tora! ", you'll probably gain something out of it. "Tora! Tora! Tora!" looked pretty incredible before on the previous Fox DVD release, and that same THX-certified transfer is back again on the special edition. Presented in the glorious widescreen aspect ratio of 2.35:1, all I have to say that this is a transfer that will drop your jaw to the ground. For a film that's now over thirty years old, the result is really, really impressive. The film starts out a little shotty, but really cleans up. Black level is great, detail is pretty fantastic and hues as well as fleshtones are really accurate, to help bring the documentary-style of the film to full life. However, there are some bits of grain, and the look of the film is a little bit soft and faded. In the end, it's a great clean up that really shows that old films can still look great if given good treatment. Also from the old DVD release, Fox gives us a nifty THX-certified 4.1 track for "Tora! Tora! Tora!" as well as English Dolby Surround and French mono tracks. The 4.1 is pretty much mono spread around, and you can tell the age of the sound due to some pretty low fidelity. I had to crank my speakers up a bit, but as far as the actual track, it really did surprise me. There is some really nice speaker use here, such as with planes flying and the action sequences. The music sounded excellent too. However, I felt there could have been better surround use in some areas and more split surround use, to give a more enhanced enhanced effect, sort of like actually being there. I noticed a few missed times where this could have occurred, but in total, a lot makes up for it with other great sounds to draw you in. More bass extension would have been nice as well, but it does a fairly good job during the action sequences. You'll probably really like this track, and if you don't, you have a choice of English Surround and French mono, as well as Japanese and English subtitles. 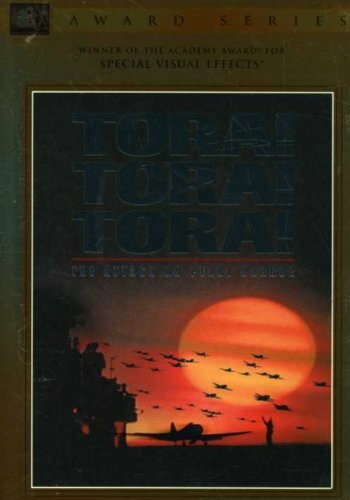 The previous Fox edition had three war film trailers (included one for "Tora! Tora! Tora! "), but this new special edition has some really good supplements. So if you bought the old version... you probably will want to buy it yet again. So yes, you get the Theatrical Trailer for "Tora! Tora! Tora!" in full frame and two channel sound. It looks terrible with a lot of grain, dirt and a lot, but it's pretty interesting to see an old trailer compared to so many new ones. It's a little long, and they make it seem like a whole cliffhanger and try to get you intrigued (though you should know some of the answers if you know your history). After so many new trailers, it's a nice change of pace to watch an old one. A new Twenty Minute Documentary entitled "Day of Infamy" is actually more like a featurette. This is a pretty nice watch, as it isn't really about "Tora! Tora! Tora! ", but rather, the acutal Pearl Harbor bombing. Clips from the film are shown in non-anamorphic widescreen, and there is a lot of newsreel footage as well as stil photographs. Historians also give some insightful and deep thought onto the event, and while it doesn't really have anything to do with the movie, it explains some things further and is a nice compliment to the film. Finally, I saved the best for last. A Commentary With Richard Fleischer and Stewart Galbraith. This is one of the best commentary tracks I've heard in a long, long time and I was very pleased that it was included on the disc. Things are not always screen specific, but they go into an amazing amount of detail about the production. Earlier in the review I mentioned Kurosawa doing the film, and there's a good amount of talk about him, and how the footage he shot was not used (why not put it on the DVD?). If you liked the movie and want to learn about the rich production history of it, you must listen to it. There's a lot to gain here. Again, you'll probably want to replace your old "Tora! Tora! Tora!" DVD if you have it, as this new special edition from Fox is really good. The presentation is well done, and I was glad to see the new supplements on the disc, as they give more on to the film and Pearl Harbor. "Tora! Tora! Tora! "is a very well done, balanced, intelligent and entertaining movie. If you like the film, it should definitely go in your collection. If you haven't seen it, be sure to check it out. This new edition also has a surprisingly low price... so do what you have to do.